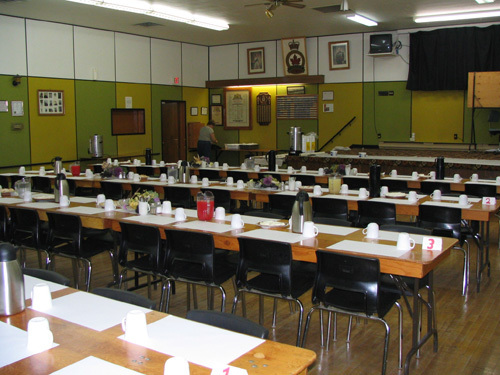 Coming up there's the Bowsman Fall supper on October16, followed by the Birch River offering on Oct. 23. Rumor has it there may also be one scheduled in Mafeking, but that could not be confirmed. 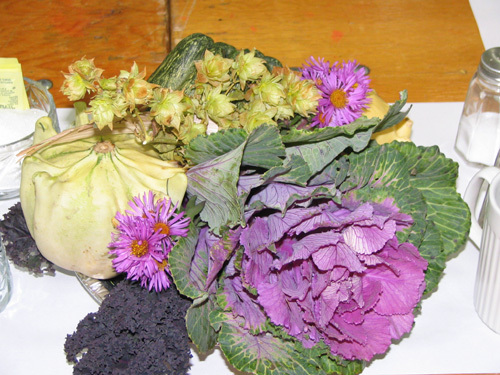 What is it about these community food fests, these Fall suppers; and what's the attraction year after year? The general consensus says it's a prairie tradition, both north and south of the border, and that fact, apparently, is indisputable. What the folks who research these types of things also know for certain is that, for over a century, Manitobans have been celebrating the fall harvest with community suppers held in church basements and halls. Everything else you hear about the origins can depend on who you talk to and where they live. What the suppers actually mean to the individuals in personal, but there is often a common thread. Makarchuk says, it all began for them in Durban over 40 years ago. It was known as Offerfest, a form of thanksgiving feast, which included Swedish side dishes. Over the years they've changed both menu and name. "We started moving towards more Ukrainian style foods along with richer desserts, fried chicken and meatballs and gravy," she says. 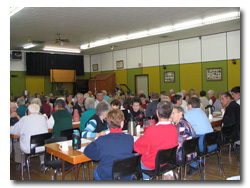 And with the changes came a new name the Fall supper - which seemed to be more a sign of the times. Makarchuk says they still see the event as a time to celebrate, give thanks and to fellowship. 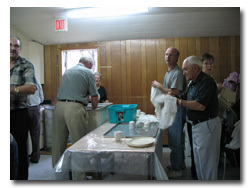 But it's also a chance to raise funds for the church missionaries. Gordon Jeffrey, a Swan River resident who farms near Bowsman, is a chronic repeater on the circuit. After sitting down to four Fall suppers annually for 40 years, he either holds the record (if there is a record) or he's closing in fast. 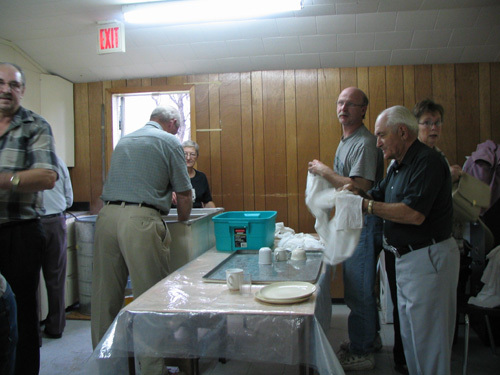 Jeffrey was at the Ukrainian Orthodox Church affair, and he and his wife help out with the Bowsman supper through the United Church. He syas they're into it in a big way, serving 300 - 500 people. The idea started as a fowl supper, but changed in the menu necessitated a change in the name. "We used to call it a fowl supper and we used to serve turkey," he says. 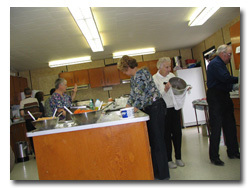 "But there were so many fowl suppers around we decided to make a change and go with beef. 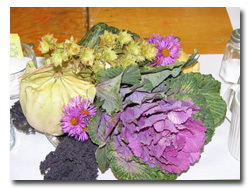 Now we serve a roast beef dinner with gravy, perogies and salads with lots of far vegetables." Jeffrey says he likes the idea of celebrating the fall harvest, and he also sees the dinner as a fundraiser for churches. "But it's also a community thing," he says. "It's an opportunity to get out, to see people"
Isabel Patience says Birch River also has their own Fall supper, but they don't stop there. They follow it up with a spring smorg where a hot item is - spring delight , a fancy name for puddings and cakes. Patience says their meal is the usual fare of turkey, cabbage rolls and perogies - foods which seem to be the mainstays in the Valley - but they add a bit of spice to the evening with a silent auction. Diners buy tickets when they arrive, and they names are drawn after dinner. Patience says the prizes are small, usually donations - things like glass ornaments. 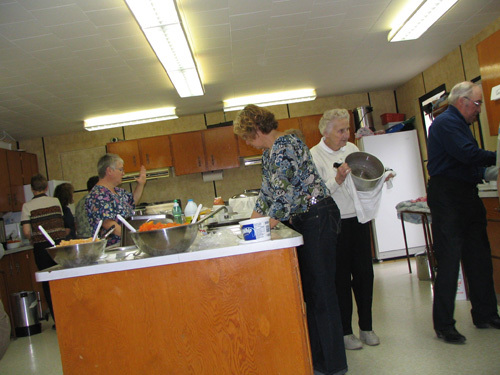 It's a small church so they get by with about 20 volunteers, but they also use actual dishes instead of paper plates, so much of the tough work starts after people leave. "People don a lot of visiting at the tables, but it's usually over by 6:30 p.m. so I am lucky if I get home by 9 p.m.," Patience says, "I'm getting older now and it's harder to do," she laughs. So the variables as you move from town to town seem to be the number of diners, the menus, which can change from year to year or staythe same for decades, and to a lesser degree the routines although those differences are minimal. 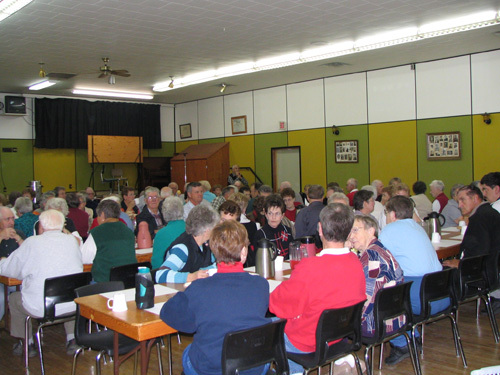 Probably one of the most unique changes in style occurred this year in Eliphinston where they held a Fall supper in the field at the Elkhorn Resort. Still, after all is said, no matter where you go, things are more or less the same. Hungry people stop in and eat supper over at least a two-hour span; some are early - first to be seated, first to leave; others slip in under the bell and visit up a storm until closing. Everybody pays, usually from $8 - $10, grabs a table and heads for the buffet line. As they glide slowly down the row, they'll discuss the choices with friends or partners and try hard to cram a little of everything on their plate before they take a seat. Everything and everyone seems relaxed; there's always a buzz of conversation, and even the most timid person won't be able to stay quiet for long. 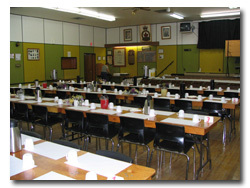 The Fall supper can have a deeper meaning to those who take part, but maybe it doesn't have to. Some, when asked what it's all about, will just shrug and say they don't know. They might joke how it's an early Thanksgiving or they're just here for the food, but that's still a good answer. If you show up you'll always get a great meal; there's plenty of it; the price is right, and nobody has to eat alone.